Add this book to your library! The Skin You Live In teaches students in grades K-2 to love themselves in their own unique skin. Throughout this book children learn their skin color does not determine if they are better or worse, richer or poorer, or smarter or dumber. The story shows the importance of self-love of all skin tones by identifying activities we mutually do in our skin such as dreaming, running, playing in rain or snow, and loving our families. The Skin You Live In further explains how imagination and heart makes us all beautiful inside and out. The Skin You Live In provides the opportunity for students to gain knowledge not only about their skin-tones but their peers skin-tones as well. 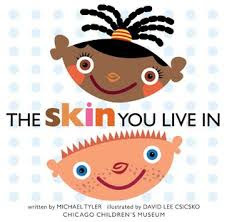 This book shows students that we all have our own unique skin, which should be valued and loved. The book illustrates that in our skin, we all run, jump, love, and swim along with many other activities. To help The Skin You Live In come alive through art, I would provide my students with small mirrors where they can view their reflections as the book suggests. I would have my students create an ‘outside-view’ self-portrait using their mirror reflections where they can explore with mixing paint to create their own skin color. Using their mixed skin tone, students can paint their own self-portraits. Once the ‘outside-view’ self-portraits are complete, students would create an ‘inside-view’ self-portrait where they list or draw pictures of who they are in their hearts and imaginations. I would then display student artwork around the classroom or on the bulletin board to show we are all united and love ourselves through our similarities and differences.